Twenty weeks down, fifty-four to go, (but who's counting?)! Time is starting to fly now as we are getting intensely busy accomplishing Humanitarian projects. We are juggling nine projects in various stages of completion at the moment. We never thought we'd say this but, our appointment books are our best friends! I have always been the multi-task-er but Denny is getting better at it every day as we have calendar planning sessions every evening and check email every morning. This week, we hit the road (or rail) visiting 3 cities. As we returned to our one-bedroom ghetto block apartment on Sunday evening, we heard ourselves say, "It's great to be home!" HOME???? Jonathan told us that this would happen...we'd finally reach a point where all this craziness felt ordinary and our former life would begin to dim. Call us "dim" but we are fully into this mission life and we love it! We tried saving some money this trip and opted for 2nd class. It was quite interesting. We shared a cabin with a young Army soldier then a 75 year-old former Communist factory administrator. Next time I'll remember to take pictures of the actors! Our first stop was a little town on the way to the Black Sea called Fetesti. We were the guests of honor at this wheelchair distribution where 12 of the 250 wheelchairs that arrived in December were given to deserving disabled people. Kind words were said about the generosity of the Church and then Denny spoke about how the donation from members and non-members made it all possible. We love this job! This was a small "distribution" and in the coming weeks, we will attend more, in larger cities, until all 250 have been distributed. This is a government official who also spoke. Afterwards, we were interviewed by a TV station. We're not sure if we made the 6 o'clock News! The recipients are taught how to use their wheelchairs in a 4 hour course. Here, a disabled man who works for the consignee that helped us import the wheelchairs, instructs us on how to transfer from chair to chair. Each recipient and caregiver gets to practice. Sometimes, smiles are our greatest "thanks". On the back of each wheelchair we give is the name of the Church, embroidered in white. On to Constanta where we attended the hand-over ceremony for a project we instigated where the Church funded the gift of 8 radiant wall heaters to a group who supports counseling efforts for disadvantaged families. They had built a center for families from donated funds two years ago and didn't have enough money to install heaters for the second floor. We proposed the project and now the work of this great charity can continue, in a warm classroom! They thanked us profusely and then Denny spoke for the cameras. He's getting infamous! They fed us wonderful foods! Along with community leaders, we also invited the missionaries who are assigned to work in Constanta. The Branch President was out of town. Last year the Humanitarian Missionaries before us completed a project where five poor families in a village were given goats to help them become more self-sufficient. They make cheese and sell the milk and cheese to have an income. During the week, the goats graze with a village herd and the milk is brought to the families by the herder. Four of the five families have been very successful in this project. The fifth family killed their goats the first month and enjoyed goat sausage. I don't think they understood the big picture! This is Paul Davies, the director of the charity. He is from Wales and came to Romania 15 years ago with a desire to help. He and a driver took us to the village to visit the family with the goats. The boys loved showing us their goats. The goats were bashful! This single-parent family has 2 children infected with AIDS. The mother is doing a great job raising this family and the boys have found purpose in their goat-raising skills. Our final stop was Brasov, in the Transylvania Alps. The snow in the old city center was melting and everyone enjoyed the first sunshine of the year. We came because Denny had an assignment to speak in church the next day. Little did I know, until 10 minutes before the meeting, I was also speaking! We arrived on Saturday and our hotel is next to the church. As we checked in, we noticed people filing into the church. They were coming for the free English class that the missionaries teach twice a week. It is wildly popular with over 100 in attendance! In another room was the advanced English class. 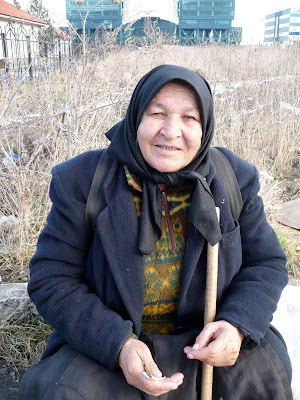 This is an all-too-common picture of yet another poor begging Romanian woman. We gave her a Lei (34 cents) and she smiled for our camera. On the train on our return home we were interrupted in our compartment by 2 begging men, sliding along the floor because they couldn't walk. They were filthy (what do you expect mopping a train floor?) and we were curious how they even got up that first huge step into the train. We wondered, did someone throw them on like baggage? After a few minutes we looked to the end of our car and saw them both standing and walking like normal! Con artists! There's a billion of them here! This week, we celebrated the 20th anniversary of the dedication of Romania. Elder Russell M. Nelson came to this spot in this beautiful park in the middle of Bucharest on February 9, 1990, just six weeks after the fall of Communism. By a little lake is a hill built from stones and it is a special place because of this history. Tuesday was a beautiful morning, about 10 degrees, after 7" of new snow fell the night before. There were about 40 of us there, missionaries and Romanians, some of which witnessed the original dedication. As our feet became numb, we experienced a moving event. We sang, and then one by one, Romanian members read their assigned text of the dedicatory prayer, in Romanian. As missionaries, we love this place because on the first day of our mission, we were brought here by President and Sora Lundberg and told about the dedication. When missionaries end their mission, they are again brought here, this time to reflect and report on the great experience the mission has been. We were the first to arrive so we snapped these pictures of the virgin snow. You can barely see the rock out-cropping. The District President, Presidentele Doru conducted the meeting. I snapped this pic of Elder Frandsen. His mom will love it! Elder Bailey set up this picture. He is a great Elder, going home in 2 weeks! Sora Radu is a lovely Romanian and one of our favorite friends. Denny and President Doru are "joined at the hip"! Elder Dummar is more serious! Afterwards, Joshua Lundberg (10) and Denny (63) threw a few snowballs. Denny started it, as you can see! On Saturday, we had another celebration. There was a program and then a party, as only Romanians can party! Left to right: Traian (the director of the program and a musical genius), Sora Turner, Traian's assistant and the Mission office secretary, the Van Ormans, office couple, the Dummars, Outreach couple, the Lineruds, Humanitarian couple. As you can see, we're great friends. Missionaries! As you can see, we're also great friends! "Holy Cow" is about all you can say about the loud Romanian music! Romanians can dance and dance. Here, Presidentele Doru "cuts the rug". We ate ourselves silly. 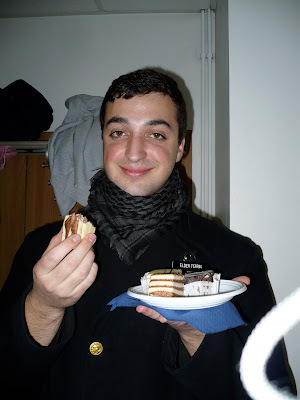 Here, Elder Ferrin shows off the desserts. We really have no idea how many inches of snow has been measured. We only know how hard it is to walk in it. We're masters at scarf-wrapping! Thank you, Joanne, for your hand-knitted one. It is my favorite! The whole snow-winter-thing wouldn't be so bad if it weren't for the wind. Drifts like these make for finding the stairs to your apartment mecca challenging, to say the least. This is a scene from our window. We watch the plows (circa 1938 storm) build the wall around these parked cars. There's a Mini Cooper that won't be going anyplace until sometime in April! Digging one of these cars out takes hours. Being the "neighborly" sort doesn't matter here. You just pile it behind the car next to you. Romania! It's hard to see in this picture but there are 12 street crew workers with garden shovels who have just finished throwing snow in the road from the tramvai platform. A few minutes later, the plow came by and threw it back on the platform! It's all very entertaining! It has snowed now, parts of every day, for a week. Romanians think it is just snow but the missionaries of the Romania Bucharest Mission think of it as "Angel Tears". We are healing from the loss of two of our missionaries and, thanks to your prayers on our behalf, we are stronger than ever. Our mission president had the wisdom to call all the missionaries to Bucharest for a Memorial for Elders Davis and Burrows. Elder Linerud and I were asked to organize the luncheon to serve 100 and we were happy to do anything we could to help President and Sora Lundberg. Somehow, we pulled it off--without a car, without Costco, without Marylou Nowels! One hundred potatoes were carried all over Bucharest, first raw, then hot! Eight Texas sheet cakes were lovingly made just so we could give the missionaries "a hug from home". Serving times changed four times, due to some scheduling glitches and flight delays of Elder Kopischke, the General Authority assigned to come. All the missionaries arrived by 9am after riding night trains and maxi-taxis. The memorial was to begin at 9:30, followed by the luncheon. We soon learned that Elder Kopischke would not arrive until 4:00. Forget about keeping 100 baked potatoes hot! The real challenge was, what do you do with 100 missionaries for 6 hours? You work them! The great Assistants and Zone Leaders sprang into action and planned an activity that will long be remembered. In honor of the two dear Elders who died (who were hard-working, bold missionaries) all 100 of them were assigned areas in the heart of Bucharest in groups of 20 or so. They were so pumped and so blessed that in three hours (in 20-degree weather) they returned with remarkable stories and close to 300 phone numbers and addresses of people who wanted to know more about the Church. It was exciting to over-hear their stories as they filled their plates. Elder Kopischke finally came at 4:00 and we had a wonderful experience talking about these great Elders. President and Sora Lundberg spoke along with 6 Elders who had served with Elders Davis and Burrows, and Elder Kopischke. Afterwards, the President and Elder Kopischke sprinted out the side door so Elder K. could catch another plane. The Elders stood while he exited and then sat down again. Sora Lundberg came off the stand and stopped and announced, "I'm giving hugs!" For the next hour and a half she hugged every missionary. It was another one of those, "I think I'm touching heaven" kind of experiences. Some sang, some just talked to passers-by. 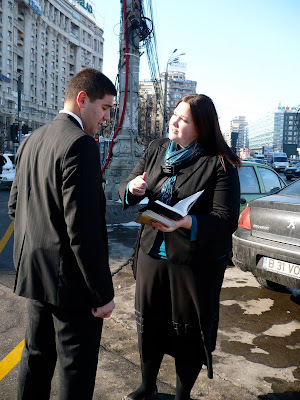 We feel it a blessing to be serving our mission in Romania. It's beginning to feel like normal life here. It's "normal" not to have a car and to walk everywhere and to wear scarfs and boots and tights and hats and button up! And, we are loving the people. Their hearts have been softened over this tragedy and they are recognizing our name tags and talking to us more. Everyone we have talked to, from taxi drivers to neighbors to people in the buses and subways, have followed the story on TV and they are very sorry this happened in their country. Romanians are like that. They feel responsible and they almost apologize. Tomorrow, we will celebrate the 20th anniversary of the Church's presence in Romania. Elder Russell M. Nelson dedicated this land to the preaching of the Gospel and promised 20 years ago that the hearts of the people would be softened. It happened 3 weeks after Communism fell during a bloody revolution. Is it more than a coincidence that 20 years ago, all these great missionaries were born and for 20 years, they have been preparing for this day?